With rain in the forecast seemingly every day again lately, it might just happen that we come close to the rainfall totals here in Dallas that we experienced last year. 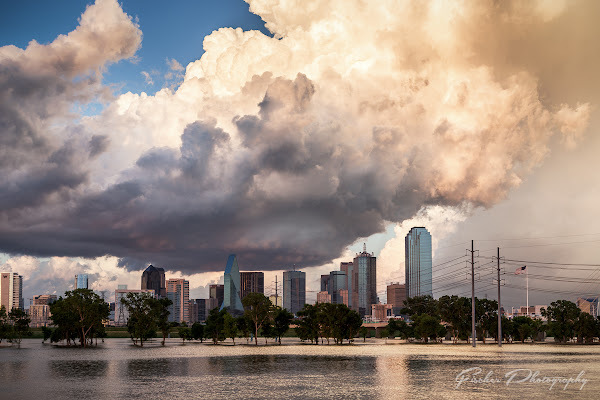 And with the peek of the North Texas rainy season nearly upon us, and a few minutes to kill, decided to sit down and try to quickly put together a few thoughts on where and how to capture the Dallas skyline when the Trinity River is swollen or full on flooded. 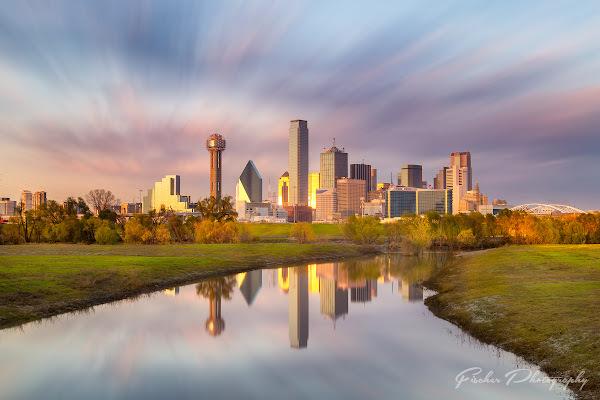 Most of my visits to the levees along the south side of Dallas have been in the evening, with the setting sun over my shoulder lighting up the skyline with beautiful soft light that is typical of that magical hour we call ‘Golden Hour’. The one trip during the morning the skies did not exactly cooperate for a sunrise, so I can’t really give my insight into how to shoot during this window just yet. 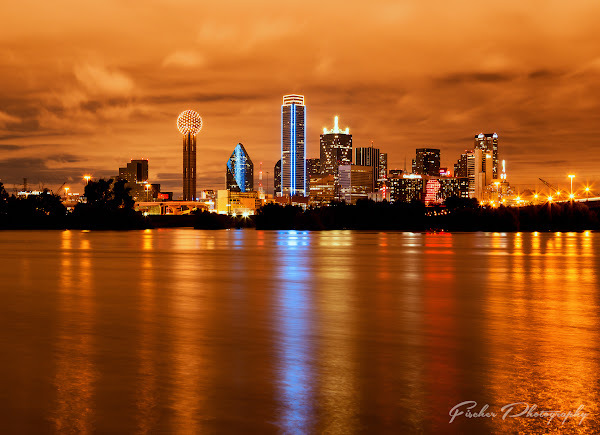 To get the Dallas skyline reflected in the Trinity River you first have to get to the river. 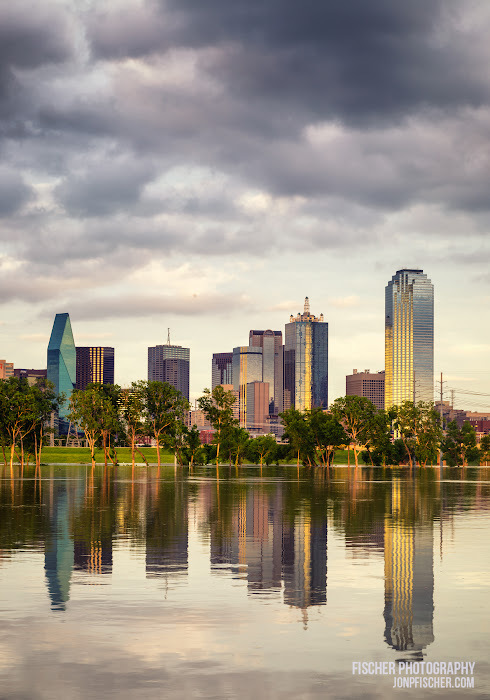 Good news is that a long stretch of the river through Dallas is flanked on both sides by a high levee system to protect the city in case of flooding like we saw last year. This also means there is a large green open area complete with bike paths and a pedestrian bridge or two allowing for overall very good access to most of the stretch of river that is suitable to getting a good skyline view. There are two locations which I typically hit. First, the Continental Avenue Pedestrian Bridge adjacent to the Margaret Hunt Hill Bridge. 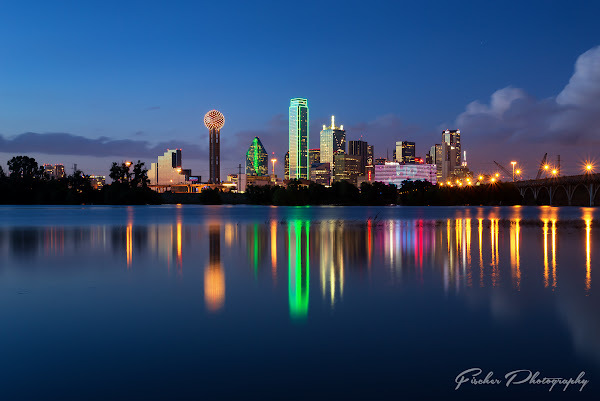 Going up stream (left as you face the skyline from the levee) gives a number of nice views with Reunion Tower and Margaret Hunt Hill Bridge to the right side of the frame. The second is just up stream (again, left as you face the skyline from the levee) from the Houston Street Viaduct. The best parking is on Greenbriar just around the corner. Note: I strongly recommend shooting at either location, especially Houston St. with a group, especially after dark. There have been attemped muggings on the trails of the Trinity in the past. Safety comes in numbers and being aware of your surroundings. 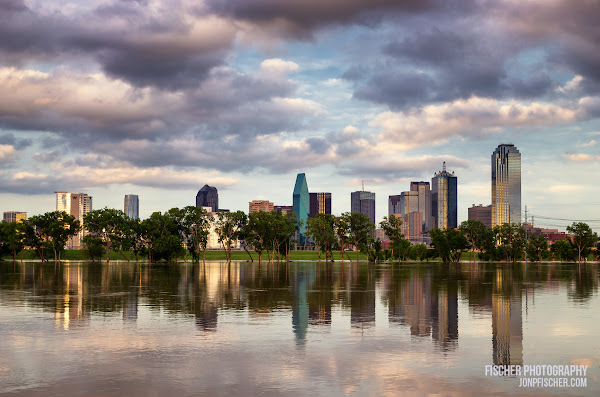 Your options really depend on just how high the Trinity River is flowing when you get there. Either of my usual locations have options for everything from ‘normal’ water levels to the major flooding conditions we saw last April and May. During my most recent visit in mid April 2016, the water was certainly up and in places outside the normal banks, but still well below the flooding levels of 2015 when the stop signs for the bike paths were nearly completely submerged. The Margaret Hunt Hill location offers a lot of different compositions, though you do have a number of large powerlines to contend with. I find that going further up stream helps get them more out of the way and much smaller in frame so they are not nearly the eye sore as they will be if standing right next to the Centennial bridge. Another choice is to work the small gap between the two bridges. From there you can progress downstream towards the Houston St. Viaduct location if time allows, or jump back in the car and drive to a new spot. Both locations are within a 5 minute drive or maybe 20-30min walk, and if the river isn’t REALLY flooded, there should be good bike/walking paths along the entire stretch. There is a third spot, convienently located mid way between the two I’ve already mentioned adjacent to the Commerce St. bridge. I’ve never had good results from the spot, but it’s worth a consideration if you’re in the area. Depending on the cloud cover, the light pollution from the city can and likely will be an issue after dark. You can either embrace the yellow-orange cast to the sky, or try to shoot only on clear nights after dark. 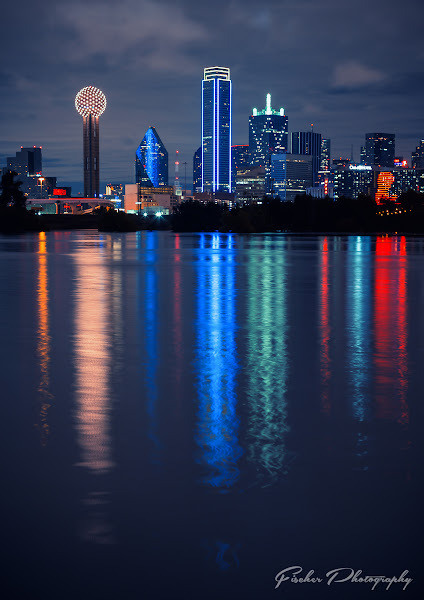 In recent years the skyline of Dallas often coordinates to light up in a multitude of colors depending on what awareness month it is, a tragedy or other significant event. If something majorly news worthy has happened in the course of the day, there’s a good chance the skyline will be lit to match. This gives a lot of unique and different looks to capture and document, keeping the view fresh and interesting. 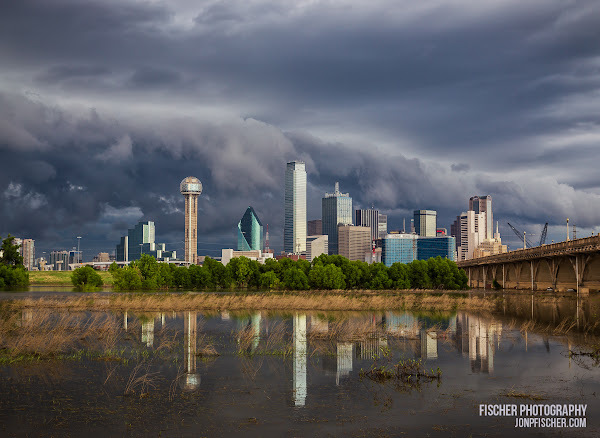 I’ve shot with everything from my Rokinon 14mm to the Canon 70-200mm at close to 200mm along the levees through Dallas. I’ve also used my 50 and 100mm primes for their awesome sharpness and minimal lens corrections when working on panoramic sets. If you’re looking for more reflection of the sky, than something in the 16-35mm range is probably best. If you want to focus in mostly on the skyline, choose a lens that will cover the 50-70mm range. My favorite close up skylines from both the Margaret Hunt Hill area as well as Houston St. are in that range. 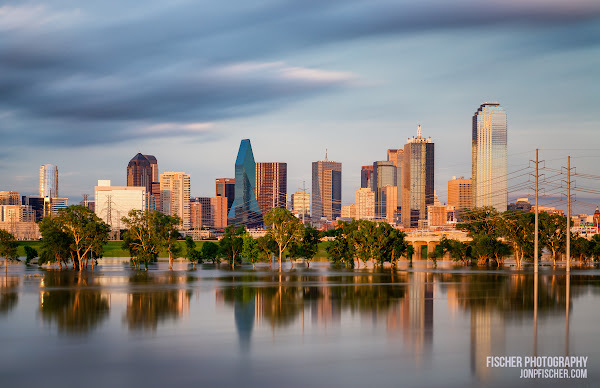 The Trinity, even flooded, doesn’t move really really fast (and if it does, you don’t want to be anywhere close to it, because things are about to get REALLY ugly), so even with the slightest wind the reflection of the skyline quickly becomes shattered. A long exposure and thus a good tripod quickly become a necessity. A model that allows for quick setup on uneven ground is best at higher flood stages as you’ll be shooting from the side of the levee at a significant angle. Likewise, if you’re wanting to shoot panoramic sets, a tripod with a bubble level on the base of the tripod is a good thing to have along so you can get that level so your whole rig stays level during the panning motion. Or shell out the money for a RRS ballhead with a panning base. Your call. During the day, to get long exposures to make the water silky, you’re probably also going to need an ND filter of some sort. I’ve recently found that the 6-7 stop strength seems to be the sweet spot for me when dealing with flowing water. Its not so dark I can’t auto-focus through it (or manual focus in live view), but gives long enough exposures where I’m not looking at stacking 20-50 frames in Photoshop later to get the look I’m going for. A 10-stop will do, but can be more cumbersome depending on how well your camera can focus through such dark glass. My 6D can do it in really good light, but any time within golden hour is not likely going to happen. 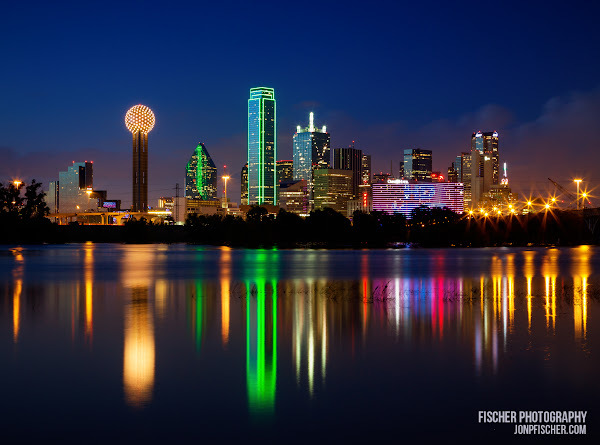 It’s Dallas! There’s a ton of other locations to shoot throughout downtown and beyond. 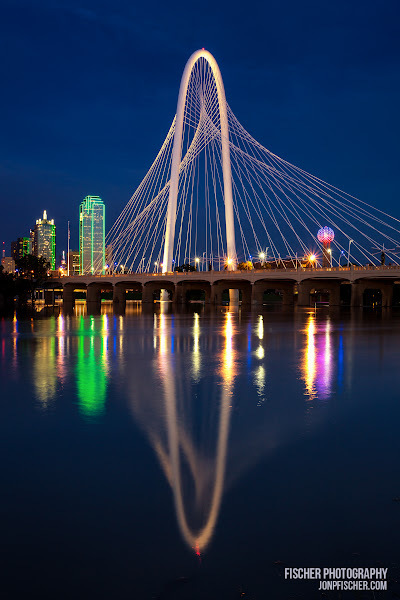 Pioneer Plaza, the Omni, Bishop Arts District, Trinity Grooves is right at your feet when you’re at the Margaret Hunt Hill Bridge, just to name a few.